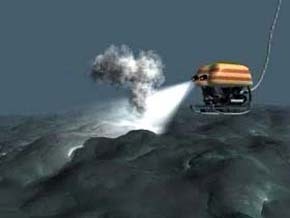 Snowblowers are a distinctive form of low-temperature hydrothermal vent. These features are characterized by copious outpourings of white flocculent material from vents, often in recently erupted lavas. The cloud of rising fluid carrying white fluffy particles is reminiscent of snow. Unlike high-temperature black smokers, where the suspended material in the "smoke" is are tiny mineral particles, the "snow" is actually biological in origin. 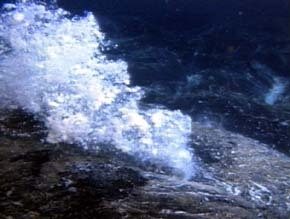 It is a byproduct of a microbial bloom in the sub-surface hydrothermal system. Volcanic eruptions invigorate the subseafloor biosphere and create these blooms.